About 2 months ago I saw a patient who had LASIK done in another clinic a few months previously. His vision when measured on the reading chart was actually very good-it was 6/6 without glasses in both eyes. However, he was very disturbed by his vision at night. He was unable to recognize faces when the surroundings got a little dark, and vision in such situations was just generally blurred. Before his LASIK, his power was only about 500 degrees short-sighted. When we did his corneal maps (topography), it was obvious why he had such problems. The previously treated zone was small, and it was also slightly decentered upwards. Our aberrometer shows clearly his predicament. When his pupil is 3mm in diameter (in bright light), you can see the image of the 'E' is sharp. When his pupil enlarges to 6mm, all you see is a shapeless smudge. Last week I performed topography guided enhancement LASIK for his left eye. A comparison of the pre and post-operative corneal topographies shows that the central blue/green area is now larger. 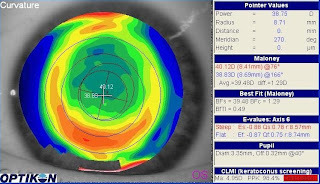 Subjectively, his night vision is much improved and best of all, his daytime vision also improved to 6/4.8 without glasses. 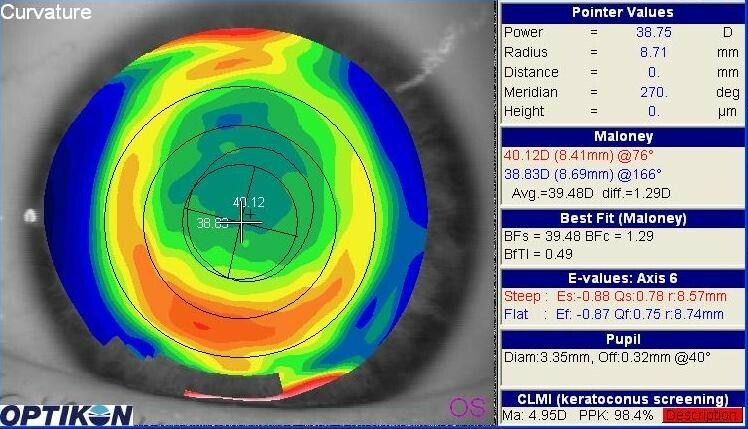 This case highlights an important aspect of LASIK which is often overlooked, sometimes because of the limitations of technology at a particular clinic. And that is-the quality of vision, on top of the spectacle power issues. In this day and age, we aim not just for minimal spectacle power after LASIK, but also the best quality of vision in all situations. There are limitations, such as for those with very high powers, because there will be issues with corneal thickness. But customizing a 'perfect shape' cornea should be possible for all those with low to moderate degrees of shortsightedness and astigmatism, such as in this case.